Digium TDM412B [TDM412B] : AddVant LLC, IP PBX, IP Phones, WiFi etc. Digium TDM412B includes 01 TDM410P Base Card / (1) S110M / (2) X100M Bundle. It is a half-length PCI 2.2-compliant modular gateway card for connecting analog telephone stations and analog POTS lines through a PC. It supports a combination of up to four station or trunk modules for a total of 4 lines. Using Digium´s Asterisk software and standard PC hardware, one can create a telephony environment that includes all of the sophisticated features of a high-end business telephone system. Using an industry-standard bursting, bus-mastering interface chip that is found within millions of PC systems worldwide, and Digium VoiceBus" technology, the TDM410 eliminates the requirement for external gateways, with industry-leading performance and price. The trunk and station modules are interchangeable, allowing the creation of any combination of interfaces. The optional hardware echo cancellation module provides 1024 taps (128 milliseconds) of echo cancellation for superior voice quality on both trunk and station interfaces. Scaling of this solution is accomplished by adding additional TDM410 or other Digium analog interface cards. 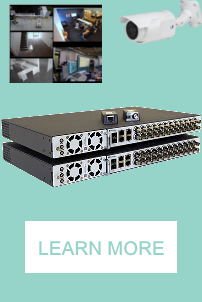 Your IP cameras no longer need a special infrastructure. Now you can integrate your old and trusted analog infrastructure with the new and feature packed IP network! Copyright © 2019 AddVant.com. Powered by Zen Cart. Responsive Zen cart templates by Picaflor Azul. IP PBXs for every bussiness. Find yours!